The 2019 Surrey Championship fixtures have been released. The 1st XI start their first season in Division 2 with a trip to Worcester Park, leaving the 2s a home match against Old Hamptonians. England kick off their World T20 campaign tonight, (Good luck, Nat! ), but locally…BIG news for Stoke. The 2019 Surrey Slam fixtures are out! The first set of fixtures for next year are out! 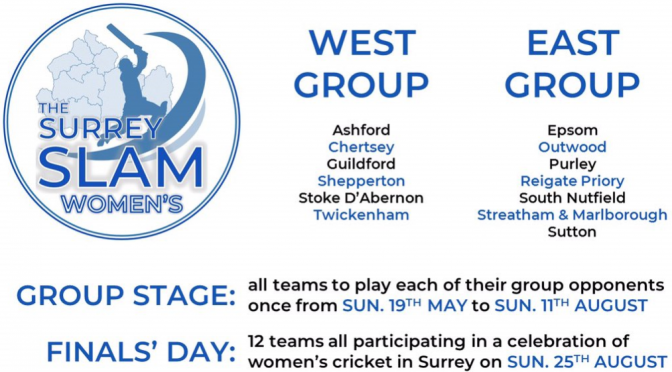 Shannon has been sent the 2019 Surrey Women’s Trust League fixtures. The 2018 Surrey Championship fixtures were released this week. As well as the build up to Christmas, a busy period for fixture-arranging is upon us. The Surrey Championship have released the League fixtures for the 2017 season. The Surrey Championship have released the League fixtures for the 2016 season. The fixtures were released a while ago, (http://www.stokecc.co.uk/2015/02/06/2015-surrey-championship-fixtures-released/), and now the new Playing Conditions are out detailing the new match and bonus points systems. The 2015 Surrey Championship Fixtures have been released. Stoke start with a home & away local derby double-header with Maori Oxshott, less than two weeks after the sides meet in a Sunday XI friendly match.